Photo caption: Cheyney University’s Chief of Staff, Sheilah Vance, Esq., far left, Patrice Jeppson, PhD, Adjunct Assistant Professor, Dept. of Social and Behavioral Sciences, third from right, and Denise Dennis, center, pose with Cheyney students (in alphabetical order) Wyneta Burton, Samantha Hall, Jesse Lucas, Mirkyle Mitchell and Tyler Trahan at 2nd Annual Dennis Farm Symposium. From its inception, the DFCLT has believed that historic preservation and education go hand-in-hand and has sought to build educational partnerships to achieve academic initiatives relevant to the farm. Today, we are pleased to say that DFCLT’s educational mission is thriving. In addition to host, Keystone College, five universities were represented at DFCLT’s October symposium including, in alphabetical order, Binghamton University, Cheyney University, Lincoln University, Penn State, University Park and Wilkes University. Already, students from Cheyney, Penn State and Binghamton who attended the symposium have proposed ideas for Dennis Farm-related academic projects he or she would like to pursue. Keystone College and DFCLT are in talks about developing an environmental academic initiative, in addition to the Keystone-Dennis Farm docent program that began this year. 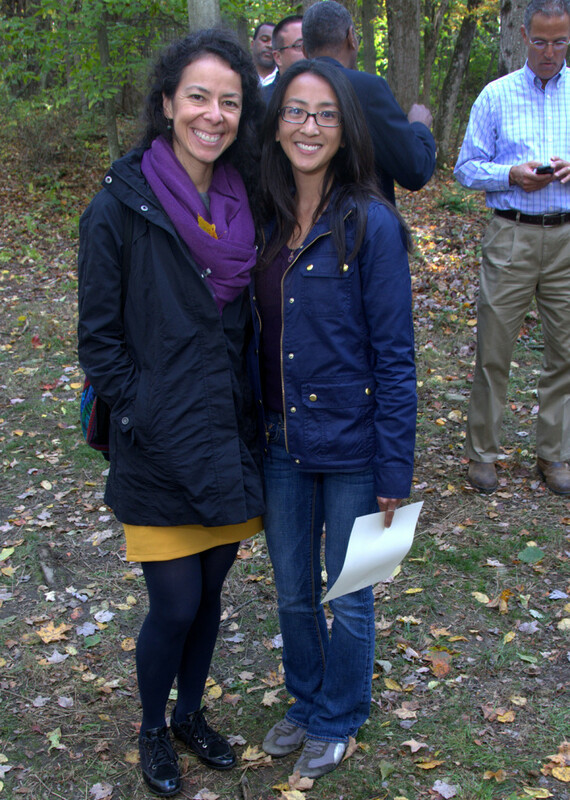 Claudia Rodriguez and Lillian Liu plan to focus on family themes in their respective projects, with Claudia concentrating on the cemetery and Lillian on the site around the house. The artifacts in the Dennis Farm Collection, many of them books, attest to the longevity of the family’s commitment to education and learning. Thus, DFCLT’s educational mission is true to the mind and spirit of the men and women who cultivated the land. Education is as central to the Dennis family’s legacy as the farm itself.